Feel free to browse our fantastic and durable selection of Dr Martens Boots ideal for safety wear or walking. A selection of styles and sizes all at affordable prices and made from water resistant lightweight material at a reasonable price from this great brand. Give us a call on 0844 209 6389 to discuss your workwear and working boot needs. The Dr Martens range at Brookes features many top quality Shoes and Boots which are available for purchase at discounted prices and can be ordered for next day delivery. Get yourself a pair of Dr. Martens today! 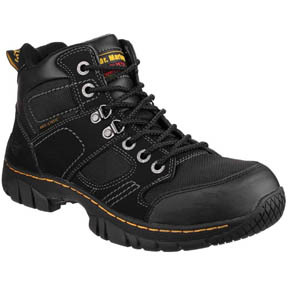 Don’t forget to check out the rest of the safety and workwear boots and shoes on offer at wholesale prices at Brookes. In the unlikely event that your not delighted remember our "zero hassle" returns policy means that you can always return your items with ease! Dr Martens Boots offer great quality and combined with free delivery options and our continued exceptional customer service, competitive pricing, and a wide range of other top brands to choose from our free catalogue or on the website, what more could we offer.